SUNY at Stony Brook, D.M.A. New England Conservatory of Music, M.M. Andrea Segar joined the Lydian String Quartet as first violinist and Brandeis University as Associate Professor of the Practice in 2016, and enjoys a varied career as a soloist, chamber musician and teacher. Her chamber music concert appearances include Yellow Barn, the Olympic Music Festival, the Birdfoot Festival, the Perlman Music Program, Music@Menlo, IMS Prussia Cove and Festival de San Miguel de Allende, among others. Andrea’s chamber music collaborations include performances with members of the Emerson Quartet, Juilliard Quartet, Peabody Trio and Mendelssohn Quartet, Soovin Kim, Colin Carr, Stefan Milenkovich, the Doric Quartet, Jean-Michel Fonteneau, Peter Frankl, and Susan Narucki. Andrea is also a frequent guest with the Grammy-nominated ensemble A Far Cry, and has performed on their recordings for Naxos and Crier Records. Andrea’s performances have aired on NPR’s Performance Today and classical radio stations nationwide. Her competition awards include first prizes in the Washington International String Competition and the American String Teachers Association National Solo Competition. 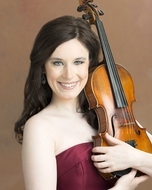 As a soloist, Andrea has appeared with numerous ensembles across the country, including the Oklahoma City Philharmonic, Portland Symphony, Arizona Musicfest Orchestra, Oakland-East Bay Symphony, ProArt Symphony, and the New England Conservatory Bach Ensemble, in venues such as the Kennedy Center in Washington D.C. and Jordan Hall in Boston. She also has appeared in recital in the US, UK and Mexico. Andrea recently developed a recital project focused on the far-ranging violin and piano music of the early 20th century, titled “The Decade Project,” at the Maybeck Studio in Berkeley, CA. Andrea received her undergraduate and Master of Music degrees with Honors from the New England Conservatory of Music, where she served as the teaching assistant to Donald Weilerstein. She has served on the faculty of the New England Conservatory Preparatory School and the Music@Menlo Young Artist Program. Andrea was also the head violin studio teaching assistant to Philip Setzer and Soovin Kim at SUNY Stony Brook, where she received her Doctor of Musical Arts degree. For more information about Andrea, please visit her website at www.andreasegar.com or follow her on Facebook at www.facebook.com/andreasegarviolin.